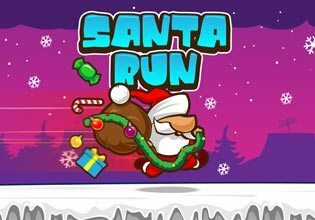 Make Santa run as far as possible and give out presents as he goes. However, it won't be as easy as it seems! There are lots of traps along the way, so be careful. You have to jump over the gaps between houses, avoid falling icicles and throw presents down the chimneys as you jump over them, because knocking into them slows you down. Will it be a merry Christmas with many presents under the tree? It's all down to you!